Brian Williams told yet another lie. The video above is from The Late Show with David Letterman on 26 March 2013. What follows is a partial nonverbal analysis. At 4:46 Williams continues, "... the now deceased former four-star general we were traveling with, Wayne Downing, said to me ah, using an old Vietnam-era f... [stutter] ah term, because he was a Vietnam infantryman, 'We're over Indian Country', ah, you'll forgive, ah, the political incorrectness ...."
Touching one's face in a certain manner just before or during a definitive statement or in the context of answering a question is highly consistent with deception. 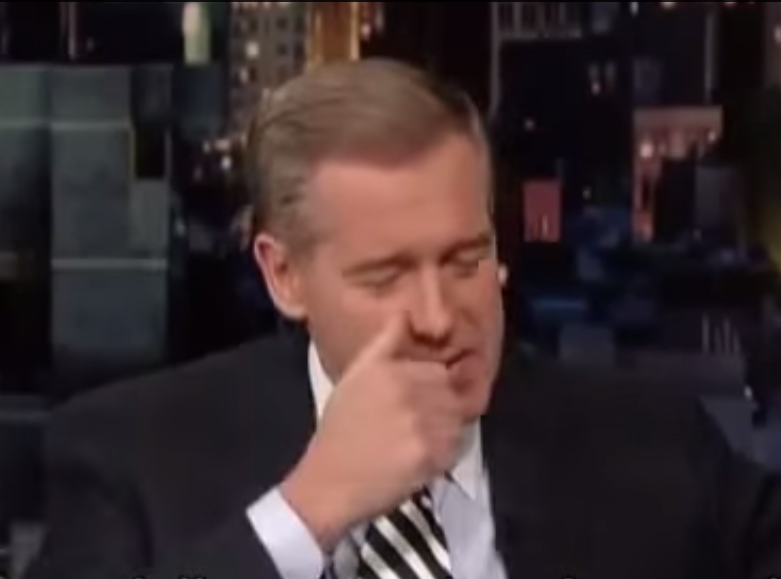 Notice that during the 4:53 - 4:54 segment, Brian Williams rubs/scratches his nose twice with his right thumb (see image below). The initiation and completion of this MAP (Manipulator, Adaptor, Pacifier) gesture is delineated above coincident with the red text. No doubt his nose itched. Anxiety caused by the intention to lie or the act of lying releases the neurotransmitter natriuretic polypeptide b (Nppb) (or a similar/related molecule) in specific facial regions - which extremely often in turn results in a very real itch. This occurs preferentially unilaterally, e.g. - in one ear, one eye (not both eyes) - but also in the mid-line, e.g., the nose or the mouth. There was something specific regarding that statement Brian Williams said that was a lie. Either General Downing never said what Williams claimed, or that he said it - but at a different time/location, or that this was not American military jargon used in the 60s or 70s, etc. But Williams did indeed lie here. When someone such as a news anchor - and a very experienced one like Brian Williams, rubs his nose (who is very accustomed to suppressing this physiology and NOT touching his face) - you can be sure that the itch was strong and thus the drive to scratch it was considerably heightened as well.